Curious about this unusual recipe? I was too, and wondered: Was this something brand new, an alternate to the usual crisps, crumbles, cobblers and pandowdys, bettys, buckles and grunts? The answer: Yes. But, to my mind (and taste buds) although perhaps not *quite* as good as the other batter-topped fruit desserts, the ingenuity behind this creation is impressive. 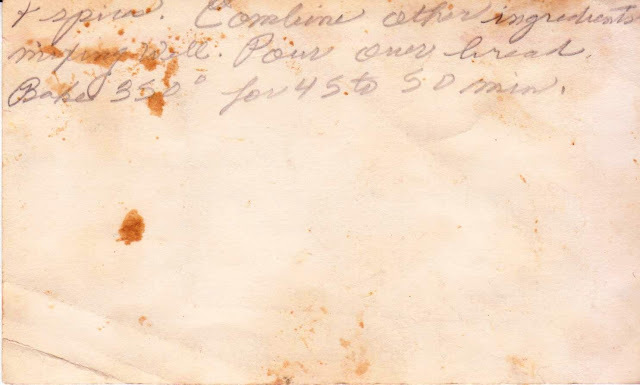 The good news is, you probably have everything you need to make this; the entire mise en place for the recipe is pictured above. 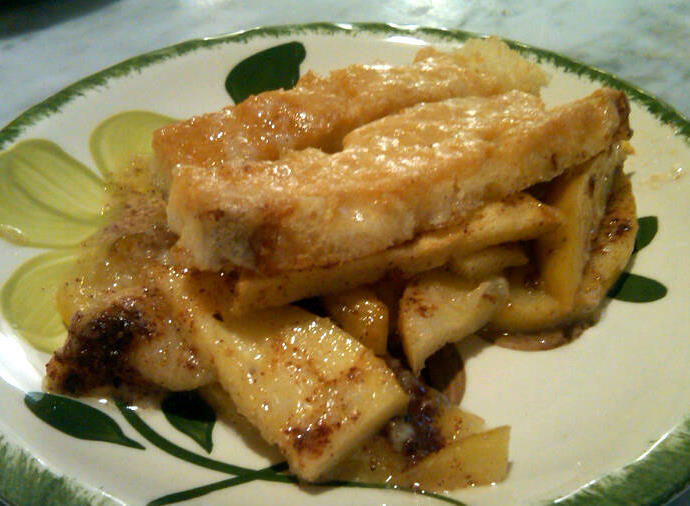 The better news is, it's easy and delicious and does taste like apple pie. 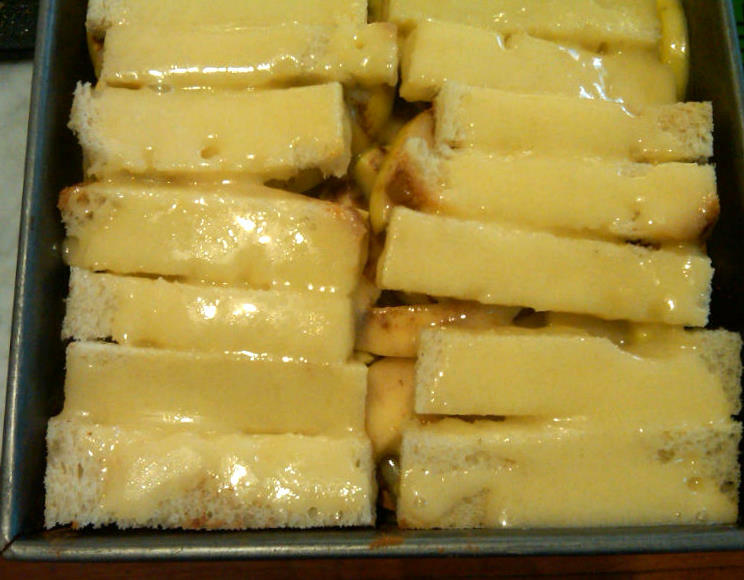 The most time-consuming part of it was melting the butter. 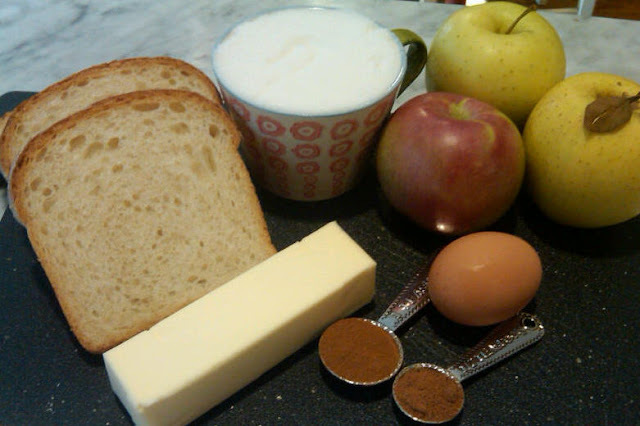 And for those who think pie is too much trouble, Loaf Bread Pie isn't -- so long as you can cut a slice of bread. 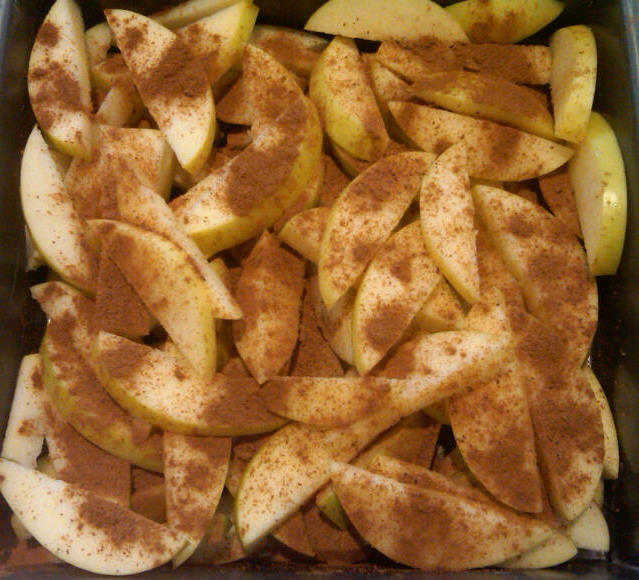 Slice up the apples, and sprinkle them with cinnamon and nutmeg. Arrange the bread slices on the apples, and pour the mixture of melted butter, egg and sugar over the whole "pie." It doesn't look great when it emerges from the oven, but cut a piece -- I used two bread "slices" per serving -- and it looks fine when plated. And no one will ever mistake your dessert for store bought. 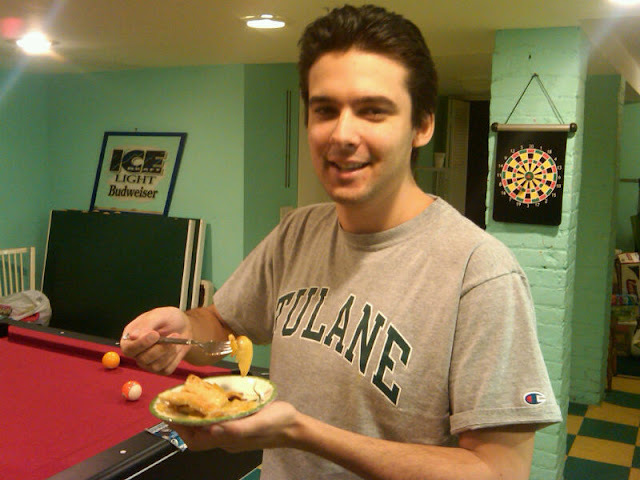 DS's friend Andrew, a very enthusiastic eater, took a break from playing pool in our basement to sample a slice. 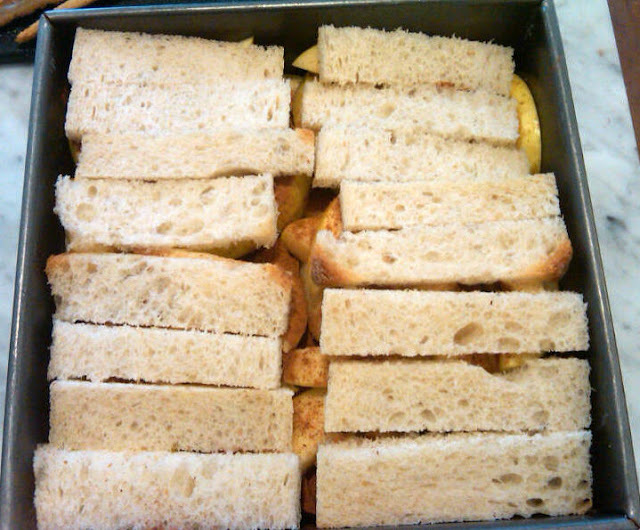 He really liked it, especially the contrast between the crunchy bread topping and the cooked apples. After Andrew had his fill and, not wanting to devour the entire dessert myself, I called on my neighbor Elizabeth, mother of two teenage boys, who happily took the *pie* off my hands. 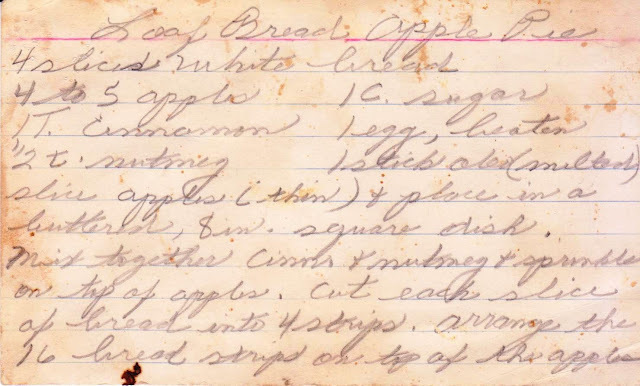 I suspect the recipe, below, was one of those created by a housewife who wanted to make an apple pie, but lacked either the time or ingredients and so came up with this gem, proving once again that necessity (and a sweet tooth) is the mother of invention. This looks great. I'll have to give it a try. It kind of reminds of recipes I've seen for baked French toast. And now that I'm thinking about it, I wonder how it would taste with canned peaches on the bottom. 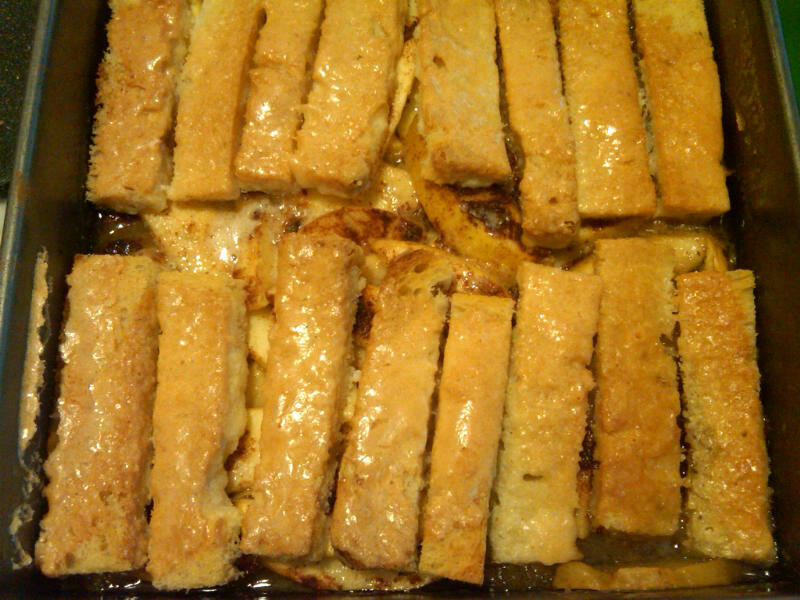 Hmmmm . . . .
Marsha: I never thought of baked French toast, but yes, it does seem kind of similar. And I'll bet it would be great with canned peaches.Thanks for writing!